1987: A heritage protection club called Tõlet was founded. 1987: Tölet’s “Thursday evenings” gatherings began. 1988-1989: The newsletters Videvik (twilight) and Hiis (sacred grove) (1988-1989) were published. 1995: The official organization of Maausk, The House of Taara and Native Religions (Maavalla koda), was established and was entered into the register of religious organizations of the Estonian state. 1995: Maausk practitioners published two articles in the daily newspaper Postimees about the ideas of Maausk. 1995: The House of Härjapea subgroup was established. 1995: The House of Emujärve subgroup was established. 1995: The House of Emäjogi subgroup was established. 2002: The House of Muhu and Saaremaa subgroup was established. 2010: The House of Viru subgroup was established. The official organization of Maausk (earth faith) The Estonian House of Taara and Native Religions (Taarausuliste ja Maausuliste Maavalla koda) was established in 1995. The beginning of the Maausk movement is linked to the social and political turmoil of the collapse of the Soviet Union. However, the communal identity formation of Maausk has a longer history dating back to the national awakening and romantic nationalism in the nineteenth century. The Taara religions refer to an earlier religious organization established in the 1930s. Maausk is understood to be based on shared Estonian ethnicity, which is part of the Finno-Ugrian folk groups. Finno-Ugrian refers to an established connection between particular languages spoken around the Baltic Sea, middle Russia, West Siberia and Hungary (Laakso 1991). Even though the ethnic unity among the speakers of these groups is debatable, the idea of the shared past of these groups was actively used at the beginning of the twentieth century to legitimize the Estonian sovereign nationality. Estonia needed a grand narrative of a historical continuum in order to found common roots and the identity of the imagined community (Anderson 1983) of a nation. To establish this kind of continuity and connection among the Finno-Ugrian languages, the past was studied and traced through folklore and folk research, and multiple research trips were made to Siberia. At the time, Finno-Ugrian identity were framed against the perceived Indo-European hegemony. During the Estonian first independence period (1918–1940), various cultural organizations were established to nurture co-operation between Finno-Ugrian groups. In 1928, a group of intellectuals established a “national religion,” Taara faith, which was based on Estonian folk beliefs, and was meant to serve as an alternative to Lutheran Christianity. The word Taara appeared in The Chronicle of Henry of Livonia, which is about a thirteenth-century crusade against the Estonians. Taara, interpreted as an Estonian god, was invoked in the battle, which took place on Saaremaa. The Taara faith was mainly a project of the intelligentsia who aimed to construct a new form of faith using the past as inspiration (Altnurme 2006:62; Kuutma 2005:62; Västrik 2015:134). After the occupation of Estonia by the Soviet Union, the organizations that promoted Finno-Ugric culture were banned by the Soviet authorities. The practitioners of Taara were also heavily suppressed, and in the Soviet era the faith existed only in a few private households and in exile (Altnurme 2006:62). During the political thaw of the Soviet Union in the 1960s, it again became acceptable to show interest in the Finno-Ugrian heritage (Kuutma 2005:55). At the end of the 1980s, many university students were interested in Finno-Ugrian culture because this heritage and identity were framed against the Soviet hegemony. The atmosphere of relaxed control during Gorbatchev’s reformist policy of Perestroika allowed young people to study and display their roots and traditions. The current organization of Maausk had its starting point in the heritage protection club Tõlet in which many of the current practitioners first learned about the religion. The club’s founding members were young academics in the university town of Tartu at the end of the 1980s who were interested in their religious roots. In events called “Thursday evenings,” Estonian folk culture and traditions were discussed. In the newsletters Hiis and Videvik, information about Estonian heritage and Maausk was disseminated. These academic youths played an important part in the creation of the public image of Maausk in the early years of the movement, organizing voluntary conservation camps in historical sacred places in nature located in countryside and public events with incantation rites in the 1980s and 1990s (Kuutma 2005:65). During this period, many of the main symbols of Maausk, such as sacred groves, amulets, stylized folk costumes and sacrificial fire were introduced. At the same time, the main values and forms of activity, such as closeness to nature, food preferences as well as joint hobbies and entertainment were developed. By the time the Estonian House of Taara and Native Religions was established in the 1990s, the few followers of Taara were not interested in establishing their own organization, but instead wanted to be part of the newly registered organization Maausk. However, the modern-day Maausk differs from the earlier Taara faith in several ways. While the early representatives of Taara presented the Estonian faith as a monotheistic tradition, Maausk is a polytheistic religion. While the intellectuals who first started to promote Taara admitted that they were creating a new religious alternative, Maausk is not considered to have been established but is perceived as being a continuation of ancient pre-Christian folk beliefs and traditions. This difference is also emphasized by the Maausk organization and its practitioners. The name Maausk refers to Estonian folk religion. Literally it means earth faith or the faith in the land. Maausk practitioners emphasize that there is no one Maausk that would be the same for everyone. It is also typical that adherents follow slightly different practices and traditions depending on the local areas and these are perceived to be indigenous traditions inside Estonia. Finno-Ugrian identity is also important for current practitioners. The folk beliefs and traditions of other Finno-Ugrian groups are highly valued and to some extent borrowed for current Maausk practice. The way in which individuals practice Maausk is considered to be a private matter. However, practices that are openly presented as new inventions are not necessarily positively received by the official organization, which emphasizes the continuity of pre-Christian folk beliefs as a basis for Maausk practice. Maausk is often described as “a way of life” rather than a religion. Maausk does not have any sacred text. However, it can be claimed that some intertextual foundation can be identified consisting of popular folk culture studies made in Estonia and among other Finno-Ugric people, like Mari and Udmurt. What is shared by the adherents is an appreciation of different forms of folk culture collected in folklore archives illustrating beliefs and practices in specific areas. Maausk adherents are also drawn to texts that subscribe to the idea that language is a formative factor in people’s thinking and in defining cultures. Thus, Maausk practitioners believe that the Finno-Ugrians share a distinct way of understanding the world (Rinne 2016:23). Even though Maausk adherents often downplay the importance of the doctrinal side as well as the disputes connected to it, some division can be discerned in the way the practitioners view Maausk. For some, historical authenticity and the heritage and practices of the past should guide practice. For others, an “inner feeling” is the most important guiding principle. The latter group is more creative and innovative in their practices, while the former is supported by Maausk’s official organization. However, there is no formal division between these groups and the line between them is not fixed (Rinne 2016:26). While Maausk contains no theological doctrinal systems or systems of moral and ethical thought, there is a general core belief in the idea of polytheistic nature, along with manifestations of the supernatural. However, practitioners do not usually like to talk about their supernatural experiences or to make grandiose testimonies of their experiences of altered states of mind. Instead, they often state that the spirits of nature are quietly present in their everyday lives. An equal relationship with nature is emphasized, and individuals are considered to be responsible for their own actions in relation to nature. This often leads the adherents to follow a sustainable lifestyle, which includes, for example, preferring organic food and natural fibre clothing. All Maausk adherents feel that their religion is based on a special relationship to nature. Nature is perceived to be alive with forces that can directly affect you and which can be manipulated through different ways of honoring and appreciating nature, like for instance giving gifts and not harming trees, plants and animals. Maausk can be defined as a form of contemporary paganism that highlights the relationship between humans and nature and reinvents past religious practices. The Eastern European variants of this set of religions can be framed as a post-socialist phenomenon and are often referred to as “native faiths.” Native faith is also the term that Maausk practitioners prefer over paganism, which they understand to be an invented practice instead of being in a continuum of old folk beliefs. Eastern European paganism usually emphasizes ancestral continuity and native pre-Christian folk beliefs and tends to be connected with ethnic pride (Aitamurto and Simpson 2013:1; Roundtree 2015:1). However, all of the East European pagan movements also have their own distinct histories and contexts. For instance, instead of subscribing to political nationalism, Maausk practitioners prefer to frame themselves as part of indigenous cultures and consequently draw on human rights discourses to defend their position in society. It can be argued that their identification with marginalized people restrains Maausk adherents from producing racist discourse (Rinne 2016:94.) However, this does not necessarily prevent the movement from adopting this kind of discourse in the future. It should also be mentioned that some latent nationalist underpinnings can be discerned in the movement. For example, no Russian-speaking Estonians are involved in the organization or in joint practices, which is not surprising given Maausk’s emphasis on local Estonian roots. People from other Finno-Ugrian ethnicities living in Estonia are welcomed to events. Because of the emphasis on Estonian roots, Maausk practitioners do not co-operate with other native faith groups. Maausk practices differ according to individual preferences and emphases. The practices are also constantly negotiated and discussed. A major theme in these debates is the wish to avoid inauthentic and Christian influences. The Estonian House of Taara and Native Religions has its own calendar era in which the years are counted from the melting of the glaciers in 8213 B.C. (Billingen catastrophe). However, this calendar calculation is more symbolic than actually used in everyday life. In the Maausk calendar, the names for the months have also been changed to what is perceived as more authentic Estonian terms. The shrines for practitioners are sacred places in nature called Hiis. These can be a single object such as a wider area on a hill or a grove (Kütt 2007:185). [Image at right] Hiis are visited alone, with family or in organized Maausk gatherings. They are places for worship and communication with the ancestors and spirits of nature. They are also places for meeting with like-minded people. The joint gatherings and rituals are conducted in these places. There are two kinds of sacred places: historical and individual. Individual sacred places are usually a single object, such as a tree or a stone, and are located in a home garden, close by a forest, or in some other meaningful place. Historical sacred places offer historical or archeological evidence of past cultic use. Some of the places are known to the wider public and are protected by nature protection and heritage protection programs. Some of them were already protected as archeological memory sites in the 1970s during Soviet times. The Estonian state does not have a common protection program, but Maausk practitioners are very active in promoting such. They also participate in many government-funded heritage protection programs. Behavioral rules in the sacred places are published on the webpage of the Estonian House of Taara and Native Religions. They are constructed on the basis of the folklore archival material and knowledge of the sacred places on Mari and Udmurt land. The rules address both the individual state of mind as well as physical appearance and behavior. According to the rules, one should be both physically and mentally clean. One should be respectful and in a calm state of mind when entering a sacred place. A visitor should also greet and say goodbye to the spirits when entering and leaving the place. The greeting is done by knocking the board hung between the trees in the entrance three times. The tree branches and any other vegetation are not allowed to be cut or torn. However, fallen branches can be used to make fire to cook food in the sacred place. All litter one makes must be taken away. Springs, offering stones and trees are to be treated with respect. One should not put one’s feet into a spring. White clothing is preferred when coming to the sacred places. These rules are constantly being negotiated among practitioners and some follow them more closely than others. According to the practitioners, the rules are meant to prepare people to leave everyday existence and enter into a sacred place and attune themselves to experience something out of the ordinary. The rules separate sacred places from ordinary forest (Rinne 2016:111-12). The Maausk calendar celebrations are based on the yearly cycle of the old agricultural society. In the Maausk calendar, there are thirty-two holidays. In past years, local Maausk groups have organized joint events on two of the holidays and have welcomed all practitioners to join in. One holiday is suvistepüha, which takes place in May-June and has in the past generally involved asking for a blessing to sow the fields, but it has had different meanings depending on the location. However, nowadays it is also about respecting the ancestors and honoring the spirits of nature. Another holiday is hingedepüha; it takes place in November and is about remembering one’s ancestors. On that day the spirits of nature are also thanked with a ritual. 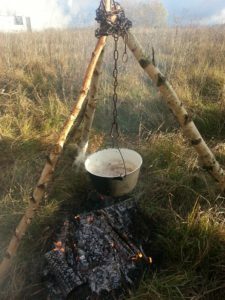 The joint meetings in the sacred places consist of particular elements like folk singing and dancing, cooking porridge over a fire [Image at right] and a ritual where ancestors and spirits are addressed and thanked. The practitioners bring home-made cooking and fruit. Along with porridge these are placed in wooden vessels on white cloths close to a sacred tree. Then the leader of the ritual addresses the ancestors as well as spirits connected to nature. 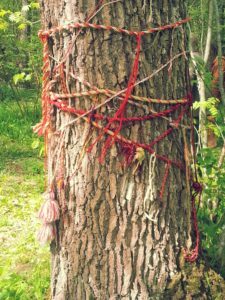 Usually a long woolen braided string is tied around sacred trees. 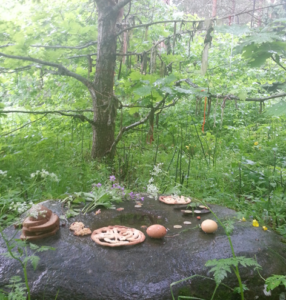 Some small individual offerings of home-made food, pastries, coins and woolen threads are placed on sacred stones and beside trees, [Image at right] with some individual blessings and addresses to the spirits and ancestors. Finally, the food is eaten in a relaxed picnic style event. People’s individual, everyday rituals may involve a variety of different practices and customs. For example, people may make food offerings to nature, fire or the house deity and bless their food before meals. Maausk adherents may also wear folkloric clothes and amulets, as well as practice dancing and the singing of folk songs. The past agricultural way of life as well as old handicraft skills are esteemed (Rinne 2016:25). Maausk practitioners do not aim to establish a utopian community, and their everyday lives hardly differ much from those of an average Estonian. However, many practitioners dream of a self-sustained living connected to nature. In reality, this dream is not easy to achieve in modern society. Maausk does not have religious leaders, and this is often emphasized by practitioners. However, there are some respected individuals who are considered to be more knowledgeable about Maausk than average practitioners. The rituals are also usually performed by the same individuals in the joint meetings in the sacred groves. These practitioners are considered to be more acquainted with the history of the folk beliefs and rituals that the current rituals are understood to continue. The Estonian House of Taara and Native Religions includes five subgroups organized in geographical areas around Estonia and perceived to have slightly different traditions as well as dialects. The subgroups include the House of Härjapea (established in 1995), the House of Emujärve (established in 1995), the House of Emäjogi (established in 1995), the House of Muhu and Saaremaa (established in 2002), and the House of Viru (established in 2010). The main organization is led by a group of elected members from the subgroups. At the moment of writing this in 2019 it consists of seventeen people and is administered by three appointees. The organization arranges a yearly event where an award with the title of a Friend of a Hiis site is given for merits in the protection of the sacred places. The winner of the yearly organized photography competitions about sacred places is also announced at this event. According to the webpage of the Estonian House of Taara and Native Religions the tasks and activities of the official organization consist of informing about and promoting the local traditions, researching the traditional culture and religions and representing Maausk practitioners in society and in questions related to religious freedom. The organization has been involved with the Roundtable of Estonian Religious Organizations, which aims to increase religious tolerance and freedom in society. Maausk practitioners have also been active in the protection of historical sacred places through court cases, of which some have been successful. The Estonian House of Taara and Native Religions does not reveal the number of its members. According to the 2011 Estonian Housing and population census, in a population of nearly 1,300,000, 1,925 people identified their religious belonging as Maausk and 1,047 as Taarausk. The number has increased since the 2000 census when there were around 1,054 Maausk adherents and Taara believers. The number of Maausk practitioners can be considered high, especially given that the affiliation to religious organizations is extremely low in Estonia, only twenty-nine percent of the population. This can be partly explained by Estonia’s history as part of the Soviet Union. Active secularization politics diminished the influence of religion on society as well as religious affiliation in virtually all socialist countries (for the Estonian case, see Remmel 2010). The post-socialist religious revival has been stronger in countries where religion or churches are intimately linked with national identity. In Estonia, such a connection is weak (Ringvee 2014). However, religious affiliation does not reveal all of the religious practices and beliefs outside of official religious organizations. For example, the number of so-called new religious groups and practices has continuously increased in Estonia. Usually, becoming a member of the Estonian House of Taara and Native Religions begins with a period of familiarizing oneself with the members, joint events and the organization. Candidates for membership are interviewed to make sure that their values and understanding about the tradition correspond to those of the organization. Some people belong to the organization and are active in it because they wish to have a voice or be represented in society at large, but their membership does not impact on their individual practice of Maausk and they do not participate in the joint events. Indeed, in order to practise Maausk there is no need to be a member of an official organization or even participate in the joint gatherings. Many people define themselves as practitioners of Maausk even though they do not belong to the organization. While in the early days university students formed the largest group in Maausk, nowadays practitioners come from various backgrounds, with different occupations and educational backgrounds. What they all share is a common interest in folk traditions and roots as well as a respectful attitude towards nature. Maausk subgroups are dependent on the activity of leaders, who bring people together and organize events. However, not all practitioners are interested in participating in the joint activities, but instead prefer closed rituals, often in family-based networks. Maausk has a rather positive image in Estonian society because it is perceived to be of Estonian origin and not a foreign imported religion (Västrik 2015). However, Estonian society does not generally view religious people or people who openly belong to a religious organization in a positive light. It can be claimed that this is due to how religion is seen in Estonia. First, it is connected to Christianity, which in Estonia has historically been perceived as a German, and thus a foreign religion. Second, in Soviet times religious people were often portrayed as mentally ill and untrustworthy and this still affects attitudes towards religious people in Estonian society. Third, as in Soviet times, there is no religious education in Estonian schools, and this creates a situation in which the knowledge of religious traditions, organizations and people is limited. Given this context, it is not easy to identify oneself as religious, and this is one of the reasons why Maausk practitioners do not like to use the term “religion” to describe their practice (see also Rinne 2016). The same reason may affect the number of people belonging to the official Maausk organization. ** Images were created by Jenni Rinne and are used with her permission. Image 1: A sacred tree and a stone in Tammealuse Hiis in June 2014, with gifts of food and coins laced on a stone, and threads tied around tree branches. Image 2: Cooking porridge on a Kunda sacred hill, November 2013. Image 3: A sacred tree in Tammealuse Hiis, June 2012. Aitamurto, Kaarina and Simpson, Scott. 2013. “Introduction: Modern Pagan and Native Faith Movements in Central and Eastern Europe.” Pp. 1-9 in Modern Pagan and Native Faith Movements in Central and Eastern Europe, edited by Kaarina Aitamurto and Scott Simpson. Durham: Acumen Publishing Limited. Altnurme, Lea. 2006. Kristlusest Oma Usuni: Uurimus muutustest eestlaste religioossuses 20.saj.II poolel. Tartu: Tartu Ülikooli kirjastus. Anderson, Benedict. 2006/1983. Imagined Communities: Reflections on the Origins and Spread of Nationalism. Fairfield: Verso. Kuutma, Kristin. 2005. “Vernacular Religions and the Invention of Identities behind the Finno-Ugric Wall.” Temenos Nordic Journal of Comparative Religions 41. Kütt, Auli. 2007. “Maarahva pühade puude ja puistutega seotud käitumisnormid – Looduslikkud pühapaikad: Väärtused ja kaitse.” Tartu: Õpetatud Eesti Seltsi Toimetised 36. Laakso, Johanna. 1991. Uralilaiset kansat: Tietoa suomen sukukielistä ja niiden puhujista. Porvoo Helsinki Juva: WSOY. Remmel, Atko. 2008. ”Religioon vastase võitluse korraldamisest Nõukogude Eestis.” Ajalooline ajakiri 3:245-80. Ringvee, Ringo. 2014. “Religion: Not declining but changing. What do the population censuses and surveys say about the religion in Estonia?” Religion 44:502-15. Rinne, Jenni. 2016. Searching for Authentic Living through Native Faith: The Maausk Movement in Estonia. Stockholm: Södertörn doctoral dissertations. Accessed from http://sh.diva-portal.org/smash/get/diva2:926135/FULLTEXT.01.pdf on 8 April 2019. Rountree, Kathryn. 2015. ”Introduction: Context is Everything: Plurality and Paradox in Contemporary European Paganism.” Pp. 1-24 in Contemporary Pagan and Native Faith Movements in Europe Colonialist and Nationalist Impulses, edited by Kathryn Rountree. New York: Berghahn Books. Västrik, Ergo-Hart (1995). “The Heathens in Tartu 1987-1994: The Heritage Club Tõlet,” Conference presentation at the Conference of Contemporary Folklore 3. Västrik, Ergo-Hart. 2015. “In Search of a Genuine Religion. The Contemporary Maausulised Movement and Nationalist Discourse.” Pp. 130-53 in Contemporary Pagan and Native Faith Movements in Europe and Colonialist Nationalist Impulses. New York: Berghahn Books.